Damian Brooks is annoyed with me. For those of you not in the know, Damian co-blogs at The Torch, one of our better milblogs. Paul at Celestial Junk had thrown out a kind of challenge to the Left on the Afghanistan intervention. He says he doesn't understand our point of view. He stops short of accusing us of collusion with the Taliban, for which I guess he should receive due praise, but claiming that our position is incomprehensible is a bit much. I made a couple of comments over there, and attracted the wrath of Damian. So let's review. I do not think that the promotion of Serge Labbé to the rank of Brigadier-General says much good about our involvement in Afghanistan. Contrary to what Damian says, this isn't just about the career soldier involved. It has policy implications. These promotions don't drop from the sky. The civilian death count in Afghanistan from aerial bombardment is possibily four times the rate of the Balkans (Kosovo and Serbia) aerial bombardment. Ordinary people are being destroyed. Coalition forces are killing more civilians than the Taliban. The current Western-style democracy in Afghanistan has been imposed by outside forces. Damian concedes that this mode of governance would not remain "if we abandon them." It's an empty shell: officially, Afghanistan is an Islamic Republic; the head of its Supreme Court is an Islamic extremist appointed by Hamid Karzai. His group knows how to play the game--pretend to be some kind of Jeffersonian democrats while foreign muscle does the dirty work, and reap the foreign aid rewards. Not that they play all that well, mind you. So either we're going to be nannies for the foreseeable future, and get more of our young men and women killed as year follows year, or we're going to stop playing favourites in a gang war. My father once said to me that you can't make people be good: he meant, to change them from the inside. Yes, you can prevent them from being bad, however one wishes to define that term. But the collateral damage from such prevention can be incalculable, so such uses of force need to be made with due care. Eduardo Galeano once referred to Soviet-style Communism as "orthopedic," and, once the shoe was removed, so it proved to be. I see no evidence that the foreign governance style imposed upon Afghanistan has been internalized. Outward signs of progress? Yup, we've got lots of girls going to school now--but they were doing that when Afghanistan was Communist and our side was supporting the folks who eventually became the Taliban. The war isn't about feminism, or ultimately about democracy. Afghanistan happened to play host, once upon a time, to Osama bin Laden. 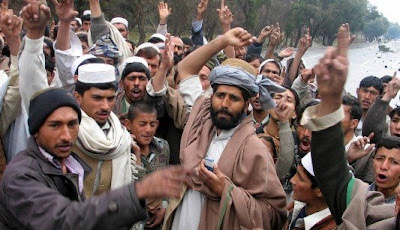 If it hadn't been for 9/11, the Taliban would still be running the joint. Meanwhile, civilians continue to die, and the opium crop this year promises to be a bumper one. *Mark Collins makes a strong retort about the occupation of Kabul here. This page contains a single entry by Dr. Dawg published on July 25, 2008 1:53 PM. Support our troops was the previous entry in this blog. While a mother mourns is the next entry in this blog.